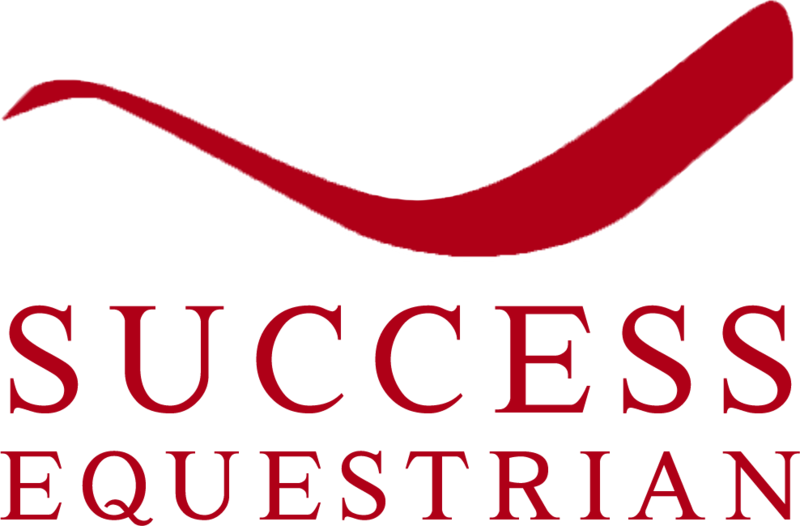 Success Equestrian carries the latest innovative designs in equestrian no-slip saddle pads for Dressage, Hunter/Jumper and Event riders. Our no-slip saddle pads will keep your saddle pad and saddle in place. No more bunching up behind your leg, no more saddle slipping too far back or riding up the neck of your horse, and no more over-tightening of girths. Our saddle pad prevents slippage on even the hardest to fit horses. We deliver a custom saddle pad fit without the custom saddle pad cost. To start, the fully contoured top line of all our saddle pads ensures complete comfort for your horse. 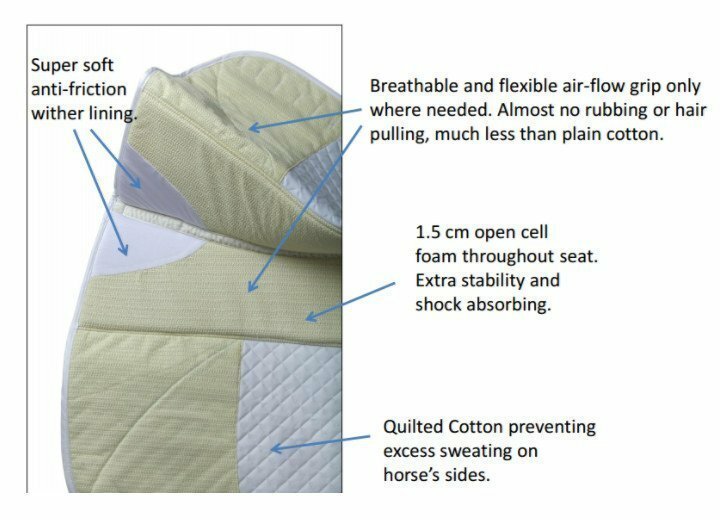 With an added 1.5 cm open cell breathable foam cushion in the seat, our saddle pad gives you extra shock absorption and stability. The air flow grip bottom layer is antimicrobial, 100% breathable and wicks away your horse’s perspiration due to the quilted cotton top layer. The underside of our saddle pads is designed with the air flow grip only where you need it. Anti-friction lining on the wither area offers your horse optimal comfort, even on those hot and humid days in the ring. Meet our most popular saddle pads, the Deluxe Dressage No-Slip Saddle Pad and the Deluxe Hunter Pad. 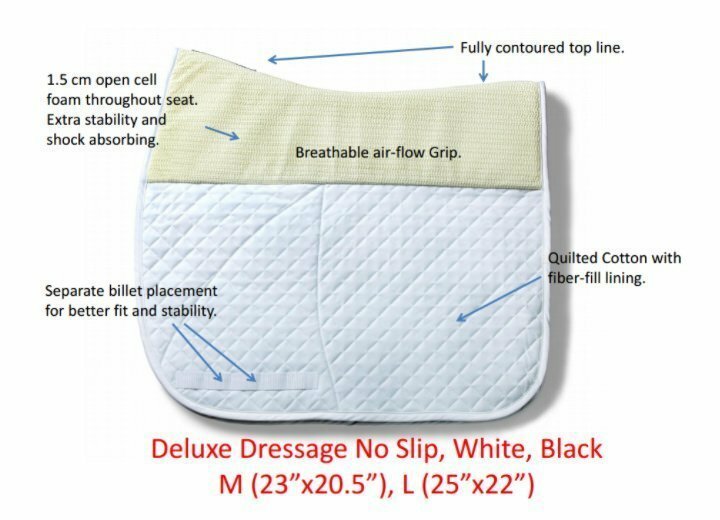 We deliver you a no-slip saddle pad with top-of-the-line materials that is easy to use, and easy to maintain. 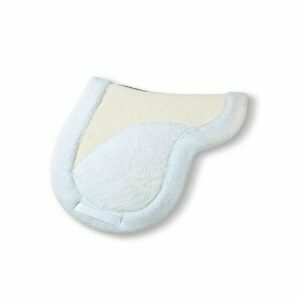 Our saddle pads are machine washable in warm water with a non-bleach detergent. Use the gentle cycle and don’t overload the washer with too many saddle pads. Launder separately with similar items only and wash regularly for best results. Avoid washing with items containing Velcro® or buckles. It’s safe to spot-treat stubborn stains. We find that “Oxy” detergents and stain removers work well. 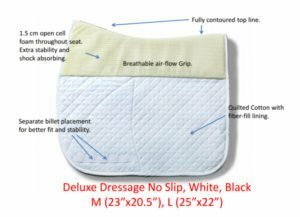 Hang your Success Equestrian saddle pad to dry for best results. They can go in the dryer on air fluff only. Do not use heat. Excessive heat from the dryer will damage or alter some of the components of the product.